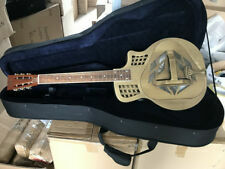 Vintage Square Neck Wood DOBRO Resonator Guitar (1984). Condition is Used. Previous owner pasted on fret markers that can be easily removed. Traction strip on player side of body and some chrome plating has peeled (see pictures) Selling for the owner's family. Shipped with UPS Ground. Body Back - Sepele. - Body Sides - Sepele. - Neck - Poplar. - Body Top - Spruce. - Fertboard - Rosewood. Great players guitar is perfect for blues, jazz, country, rock and more! - Strings - Steel. - Lower Body Width - 15". Here it is, the singing pie-plate, the high-moanin' hubcap, the Recording King Dirty 30's Resonator guitar. Play it with finger picks or a flat pick, use a slide bar (or CoricIdan bottle) or fret it. Trinity River Mudslide Resonator Guitar with Hard Case – Nice! This is a pre-owned guitar that has had very little if any play, it is in excellent condition! The keys are included with the case. Nickel-Plated steel resonator cover with Brushed aluminum cone. Premium Die Cast Tuners. The very sound and look of this fine Gretsch creation will make you want to free yourself from the damning confines of your office, your cubicle or whatever it is that enslaves you and hop the next train to anywhere with a smile on your face as big as the sky and a song in your heart. It may have light signs of use, as shown in the images. There is box rash and scratches on this resonator. Everything else is fine. It looks and works great. See photos for more details. This is very rare, but is a possibility. For gigging. Structurally sound and plays well. No gouges, dents, scratches or dings. Neck is straight, and frets with only slight wear. Set up currently for slide, but lots of height remaing on the bridge for lower action if desired. All together work in perfect harmony to assure the maximum, most articulate tone that can be heard in any playing situation. Saga's Power Reflex resonator chamber. Spruce top. Rosewood fingerboard with motherof-pearl dot position markers. Semi-Hollow Stratocaster-style Electric Guitar. GREAT ACTION. Trending at $139.94eBay determines this price through a machine learned model of the product's sale prices within the last 90 days. Very nice Gibson Dobro style F-60 round neck, 2002 model, serial number D2040820. It has a Fishman pickup installed but does not work. This guitar is a round neck and is currently set up to play like a guitar, but included is a nut height extender and a new set of John Pearse Resonator Guitar Strings. See pictures. Fret board has a couple markings, looks to be blue ballpoint pen. Guitar is in beautiful condition. This is a heavy guitar. Sounds great! #RR-36S-VS. BODY SHAPE: Square Shoulder Resonator. Blues Angel Music is proud to be an Authorized Recording King Dealer! Sand Cast Spider Bridge. NECK JOINT: Dovetail. BRIDGE MATERIAL: Sandcast Spider Bridge. NEW Dean Heirloom Brass round-neck resonator slide guitar. We do this in a way that does NOT compromise the safety of the contents. Brass Plated Body. Brass Dot Inlays. We appreciate your patience in all cases. The National ResoRocket Steel is designed from the ground up; built with a focus on the faithful players needs. The ResoRocket has a distinct tone unlike a typical single or tricone designs; drawing from both in a special way. This workhorse resonator guitar is a Bluegrass stalwart that's ruggedly built to take life in the honkytonks in stride. Available as left-handed model. Cone & Spider: Genuine US Made Beard. Tailpiece: Paul Beard 6-String. The guitar seems to have had very little use and appears to be a great survivor of the years. Being sold AS IS IN AS FOUND ESTATE CONDITION. U.S. SALES ONLY. 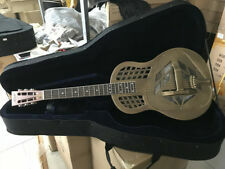 For your consideration is a used Gretsch G9200 Boxcar Resonator guitar. Guitar is in really great shape, plays well. Plays well, sounds good! This is a prototype for the new run of Paul Beard square neck resonators. Be the first one to own one of these new production models! This workhorse resonator guitar is a Bluegrass stalwart that's ruggedly built to take life in the honkytonks in stride. SQUARE NECK acoustic resonator guitar (dobro). Designed by legendary maker Paul Beard, this signature model guitar is hand made and provides unmatched tone in its price range. The Beard "open" soundwell body design utilizes genuine USA Beard cones & spiders. 16" (406.4 mm) Fingerboard radius. 1.73" (44 mm) Nut width. The heart of the sound of any resonator guitar is its cone. Regal Studio Resophonic Guitars represent quality, affordability and value. Both regular Spanish and Square neck models are available. Limitations and Exceptions. If you’re not satisfied, neither are we. Straughan Model "D". It is the only Straughan guitar to bear this number. The guitar is hand made. See the YouTube video below of Ivan Duke playing the Straughan Model D, The video will open in a new window. In the last decade, popular artists in country, blues, and bluegrass have rediscovered the beautiful and challenging Dobro.A mahogany neck features a comfortable rounded profile. The full tone of the Hound Dog M-14 is enhanced and projected by a proprietary nickel plated Dobro cone with a nickel fan cover plate, and classic f holes. The DMT Design humbucker provides great, full sound when plugged in. Crafted with a mahogany body, mahogany neck, and a rosewood fingerboard. New Gear: If you’re not satisfied, neither are we. It’s that simple. The new Gold Tone/Beard resonator cover plate features a removable palm rest making it a breeze to adjust string action, break angle, string spacing or to replace the bridge saddle without remove all that hardware. 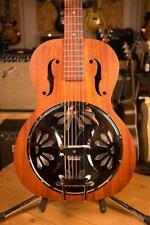 New Dean Resonator Cutaway Electric - Free Shipping! NEW Dean Resonator. exclusive outlet for Dean Closeouts, Discontinued and Factory Blem guitars. We are excited about what we do! We have a great opportunity to get great guitars into the hands of guitar lovers everywhere.And we will save you a significant amount of money in the process! This guitar is fitted with a Fishman pickup in the resonator and a Lace pickup at the neck. Very versatile. It's reasonably loud when unplugged. This unit is in excellent condition except for a small flaw (indentation) on the side (see photo) that must have been there from the factory because the finish is still perfect. This Regal resonator is in good condition with only a few examples of wear! Could use a quick tweak to your liking! Little to no wear on the frets. Super slick! 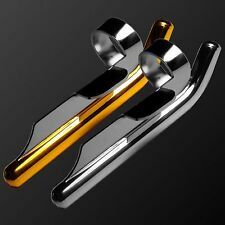 New Dean Resonator Thin Body Electric Caw Chrome Gold - Free Shipping! 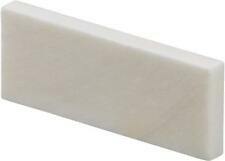 Natural, unbleached bone - the best for tone transmission. Ready for string slotting and final shaping. x 3/16 in. Oversize length and height allows for custom shaping. The rosewood fingerboard displays large split block inlays. New Gear: If you’re not satisfied, neither are we. It’s that simple. Recording King SO-998-EF Resonator Guitar, Limited, Style-O, Roundneck, body Nickel-Plated Bell Brass, neck Honduran Mahogany, fretboard Paduak, 19 frets, MOP fretboard inlays, scale 632mm, nut width 43mm, Hand-Spun 9,5" aluminium cone, hard maple with ebony/maple bridge, Chicken Feet cover plate, tailpiece bell brass, nickel-plated tuners, Finish Nickel-Plated Bell Brass, Flower Engraved. The Dean CE Acoustic-Electric Resonator Guitar features a modern body design and electronics. The resonator guitar has a mahogany top, back and sides, a mahogany neck, and a 21 fret rosewood fingerboard. Gold Tone Paul Beard Signature Series Dobro Round Neck. It is Used but it’s in great condition. I’m throwing in a hard case with it, one of the buckles on the case is broken but it’s got 3 more so it still closes just fine. I did also get a basic tune up so it’s ready to go if you are. Style #7111 "14 fret". Blackwood Tek fret board. Hand spun aluminum "Continental" cone. Materials: Bell brass. 17" body length. 14 frets to the body. 3" body depth. Cover plate: Diamond. Does not include stand. See pics for quality. I acquired it new in 2007. In super condition. As I inspect it there are a few fine marks/scratches that you really have to hold it on the right angle and look very close to find them. Very minor. The Recording King tricone is made from nickel-plated bell brass and features a T-shaped bridge with an ebony and maple saddle. The bridge is connected to the center of each cone so that when the strings are hit, the vibrations run through the saddle and then into the bridge. This Is an absolutly beautiful guitar! This is the Paul Beard Signature Series round neck Deluxe model. It's truly "like new"! The starburst finish is nothing short of spectaculat! The MONO case is a great addition.